A young girl masturbates a man under a newspaper as she licks her ice-cream beneath a head of blonde pig-tails. 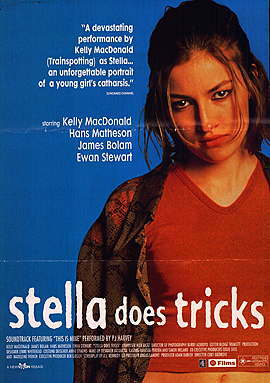 The girl is Stella, a young prostitute living in the back streets of London, who's decided to make a few changes in her life, namely leave her pimp and follow her dream to lead a stable existence with a job and her own place to come home to. She meets up with a drug-addict called Eddie and though things seem sweet to start off with, it seems that Eddie is unable to keep his promises to stay clean plus her old life is never far behind. A dreamer forced to face reality, one of Stella's first steps is to get even with her father, a two-bit comedian and alcoholic. Let's just say that Stella turns up the heat when she visits him in her hometown of Glasgow... there's also a twist at the end, as with all good yarns. Entertaining, disturbing, gutsy and with two gorgeous leads to boot, 'Stella does Tricks' is a great way to enjoy the dark arenas this winter. Ying is a regular contributor to Voiceworks magazine.